Six prominent academics and industrialists from the Ukraine and Russia have produced this highly-detailed account which covers the classification, manufacturing methods, treatment and properties of the non-ferrous metals ( aluminium, titanium, magnesium, copper, nickel, cobalt, zinc, cadmium, lead, tin, bismuth, noble metals and earth metals). 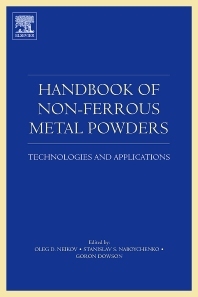 The result is a formidable reference source for those in all aspects of the metal powder industry. Covers the manufacturing methods, properties and importance of the following metals: aluminium, titanium, magnesium, copper, nickel, cobalt, zinc, cadmium, noble metals, rare earth metals, lead, tin and bismuth. English translation and update of book previously published in Russian. Metal powder manufacturers, metallurgists, engineers, equipment manufacturers, R&D scientists, end-users of metal powders. Introduction: Chapter 1. Classification of methods for production of non-ferrous; metal powders. Properties of powders and areas of their use; General information about powder manufacturing methods; Physical-chemical and technological properties of powders; Nano-structured particulate materials; Measurement methods; References to Chapter 1. Chapter 2. Manufacture methods of metal and alloy powders; Mechanical grinding; Mechanical alloying; Nano- particle synthesis; Atomising and granulating; Special rapid solidification methods; Gaseous phase manufacturing methods; Theoretical principles of evaporation-condensation; Conditions of powder formation; Formation features of alloy powders; Chemical precipitation; Equipment to produce powders; Carbonyl manufacturing method of metal powders; Manufacturing of metal carbonyls; Manufacturing of powders by thermal decomposition of metal carbonyls; Properties and applications of carbonyl metal powders; Safety precautions and environment safety during carbonyl production; Reduction methods; The hard-phase reduction of metal oxides and their salts; Metallothermic processing; Chemical reduction; Chemical deposition from solutions; Autoclave deposition; Electrochemical methods of powders manufacturing; Physical-chemical principles of electrocrystallisation of dendritic precipitates; Electrolysis of water solutions; Cementation method; Electrolysis of melts; Methods of amalgam metallurgy; Manufacturing of composite powders; Metallic hollow spheres; Special methods of powders production, include: electro-erosion method; thermal, chemical and electrochemical desintegration; ultrasonic atomisation; rotating consumed electrode atomisation; vacuum atomisation; centrifugal atomisation of rotating melt jet; gas atomisation of rotating melt jet; impulse atomisation; arc pulsed plasma atomisation; combination of free-fall gas atomisation with centrifugal atomisation well. References to Chapter 2. Chapter 3. Treatment of powders and equipment for their realization; Dehydrogenation; Passivation; Particles classification to their size; Mixing; Dosage. Packing. Interoperational transport; References to Chapter 3. Chapter 4. Powders of non-ferrous metals and alloys; Aluminium and aluminium based alloys; Titanium and its alloys; Magnesium and its alloys; Copper and its alloys; Nickel and its alloys; Cobalt and its alloys; Zinc, cadmium and their alloys; Noble metals; Rare-earth metals; Lead, tin, bismuth and their alloys; References to Chapter 4. Chapter 5. Safety engineering techniques and environment protection: Dangerous and harmful production factors; Ways to prevent from dangerous and harmful production factors; Purification of recycled water; Dust separation and gas purifying; Utilisation of the waste. Storage of metallic powders; References to Chapter 5. Naboychenko Stanislav Stepanovich is Corresponding Member of the Russian Academy of Sciences, Professor, and Doctor of Technical Sciences. Naboychenko S.S. is a member of the editorial boards of the leading Russian metallurgical journals "Non-Ferrous Metals", "Russian Journal of Non-Ferrous Metals". He is an expert in the field of hydrometallurgical processes; he devoted a large number of works to autoclave processes, the author of more than 450 scientific papers. Stanislav Stepanovich Naboichenko is a recognized scientist in the field of autoclave hydrometallurgy of non-ferrous metals, the author of a well known in Russia and abroad study dedicated to kinetics of dissolution of copper sulfides, non-ferrous alloys, hydrogen precipitation of copper, antimony, bismuth powders and the synthesis of a number of their compounds. He proposed a number of advanced technologies for processing copper-zinc concentrates and industrial products of copper secondary raw materials. Oleg Domianovich Neikov holds a doctorate in material science at the Institute for Problems in Materials Science of National Academy of Science of Ukraine (IPMS), Kiev, Ukraine. Since 1970, he has been worked at the IPMS where he was promoted from research assistant to the head of the department of metallic powder synthesis and processing. During 40 years, Neikov was a member of the editorial boards of Powder Metallurgy and Metal Ceramics Journal. Dr. Neikov is author of more than 350 scientific publications, more than 40 patented investigations, and 8 monographs, including ‘Air suction and dedusting in production of powders. Moscow (Russia): Metallurgia; 1981, Handbook of non-ferrous metal powders. Moscow: Metallurgia; 1997 [in Russian], Handbook of non-ferrous metal powders. 1st ed. Elsevier; 2009. His professional main field is the powder metallurgy of reactive metals (powder obtaining and processing; phiysics of flammability and explosion of metal powders); the current research interests are the rapid solidification processes, melt atomization and surface chemistry and physics. Nikolay Aleksandrovich Yefimov holds the Ph.D. degree in Institute for Problems in Materials Science of National Academy of Science of Ukraine (IPMS), Kiev, Ukraine in 2000. Since 2015, he has been working as a leading researcher in IPMS. Nikolay Yefimov graduated from the Kiev Polytechnic Institute in 1992 with a specialization in "physics of metals". Nikolay Yefimov is author of more than 120 scientific publication, including monograph Quasicrystals and nano-quasicrystals are new promising materials. In: Promising materials, Vitebsk, Belarus, 2009.